VanessaAlvarado.com is a blog filled with first-hand, honest, thoughts and research on small business ownership. I started it while working as a web marketer and kept going when I left the office job to become a full-time vintage reseller. 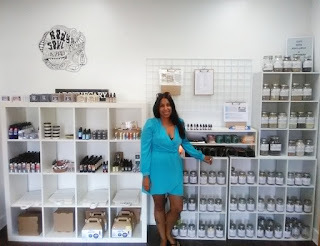 It took years of trial and error + never giving up, but I now run a six-figure natural body care brand with its own small local shop. Our brand is unique because we make ALL the products on the shelves save for a few add-on accessories. This leaves me with little free time to keep blogging daily at the quality I'd like to put out. I'm always researching and writing, I know I will write again in some form, but for now, putting the blog in archive-form is the right choice. Below you'll find some of my favorite posts. Thank you for reading! - My KonMari Method Journey: How to Organize Your Home Once- And Never Again! - Guides for Organizing Your EVERYTHING: Home, Schedule, Money, Cleaning, Life! Anime fan and general Japanophile. Unabashed lover of all-things-kawaii. Random, but it appears my most-viewed post on all time is a tour of my old office cubicle! I once lived in a camper on a mini-farm with a boyfriend--- and no internet! Loved it. It's weird for a young tech-person who works on the web but ...I hate smart phones and struggle to use them. Feel free to contact me if you have additional questions.